Leaving Peniche, we were only about twenty miles from one of the places on our “must visit” list. 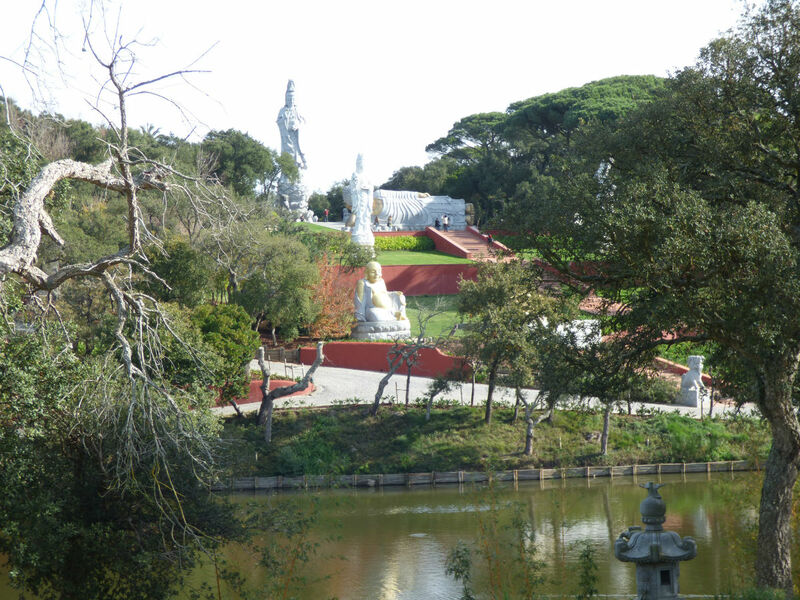 Buddha Eden – this is a peace garden filled with sculptures, lakes, pagodas, giant Buddhas and terracotta soldiers. It was created by a vineyard owner as a response to the destruction of the Buddhas of Banyan in the 70s. We had been told about the place by our friends Katherine and James last year and promised ourselves a visit. Its purpose is a “place of reconciliation” and visitors are invited to take some time to reflect and enjoy the atmosphere of peace and welcome. Long-term followers of the blog will know that we love to visit Taizé in France, another place of reconciliation and peace, so, once we knew about Buddha Eden, we knew that we must go to see it. Nothing prepared us for the beauty and the wonderful energy here. Entry costs 4€ and, for those who would find the walk around the huge park too challenging, you can buy a ticket for the train that carries passengers around the park, allowing for visitors to get off and on again at a variety of stops. We opted to walk around the gardens at leisure in the sunshine, stopping to look at the massive variety of sculptures and to allow ourselves space to experience our responses. It would be impossible to do this for every single sculpture and every corner of the beautiful gardens so we chose to relax, knowing that we could easily return another time and have a completely different experience. Shirley being a terracotta warrior. This is some tall lady – I checked it was ok to sit on the steps. Some visitors were in a completely different mindset to us, going around laughing and being playful. This didn’t spoil the experience at all – it was a sunny Sunday afternoon and we could live and let live. Signs everywhere ask you not to touch the exhibits yet some visitors were climbing right on to massive Buddhas to have their photos taken. We chose not to react to this, walking away and looking elsewhere. The critical monkey that comes to sit on my shoulder tried to whisper in my ear but I told her that I wasn’t at home to Mrs Disapproval. We felt sure that regardless of a visitor’s state of mind or apparent lack of respect, this place would be sure to have an effect. We left feeling rested and relaxed. If you decide to visit Buddha Eden you will find it well signposted from Bombarral. Being used to the ridiculous prices charged in cafés in British places of interest we had something to eat before we went in. Once inside we discovered that you could have a full three-course meal with coffee and wine or a soft drink for about 11€. The food looked good and plentiful and it would have saved us cooking dinner that evening. There is an Intermarché with motorhome services and a launderette down the road in Bombarral. Driving on another 30 miles or so we chose to stay on a little motorhome park at A-dos-Cyunhados. Our only reason for choosing it was convenience after leaving the Buddhas late in the afternoon. It turned out to be a great find for more reason than one. The parking and free services are on the edge of the town park where there is plenty of room to walk dogs, a children’s playground, tennis courts and a swimming pool. Parking is under the beautiful church, lit up at night and thoughtfully arranged so that the bells stop at ten in the evening and don’t start again until seven the next morning. On our first evening, a young couple with a small child met us and made friends with the dogs. They spoke no English or French so we could only communicate with words that Portuguese and French have in common. Interestingly we managed to answer questions about the names, ages and gender of the dogs. Poppy played with the happy wee boy and Boo stood beside the mother and accepted her strokes gratefully. They told us that they were Brazilian and that they loved dogs. We all smiled a lot and watched the dogs’ antics and laughed with the little boy. These encounters are often enough to put a smile on our faces for hours. That night poor Shirley was stricken with a terrible dose of the intestinal gallops. She was up half the night and I woke the next morning to find her pale and cold and distinctly under the weather. Fortunately for us, we were parked beside the service point in a quiet place with no restriction on the length of stay so we put the heating on, battened down the hatches and waited out her internal storm to run its course. Sometimes we have to remind ourselves that we’re on this trip for the long haul and there is no pressure to get anywhere. If we were at home and one of us was unwell we would just let nature take its course and live quietly. In the motorhome, we do exactly the same thing. Twenty-four hours later and Shirley was back to normal and we were on the road again, this time to the town of Mafra about 20 miles north of Lisbon. The attraction here is the gigantic Mafra Palace, built by successive royal families over several centuries. We read that there was nothing much else to say about Mafra but that the palace was well worth a visit – so that’s what we did. Arriving on the motorhome parking we found that we were in the palace carpark on smart pitches with services and – surprise, surprise – free electricity. A young British man showed us the covers over the hookups, explained that there was only one between two pitches but you could get a splitter at the Chinese Bazaar down the road and share the electric. Off we went in high spirits down the road to get the splitter, noticing as we walked that there was a Lidl and an Intermarché. Being easily pleased having easy access to both of these and a Chinese Bazaar made us very happy. Back at the van clutching our prize of a three way splitter I asked the Frenchman next door if he would be kind enough to share his electric with us. He was very affable, if a little anxious, and together we put the splitter onto the hookup and lo and behold two vans had electricity. He warned me that the current was low and it would only run the fridge and the lights but that was all we wanted so we were happy. After all the domestics were done, the dogs walked and the van warm, we walked towards the palace to investigate opening times in preparation for our planned visit the next day. We were surprised and very happy to find that as well as the edifice that is the palace there is a lovely little town full of cafés, small shops and restaurants. It was very cold that afternoon so we dived into a pleasant looking cake shop, Café Polo Norte where we chose cakes and coffee to enjoy in the warmth of its welcoming lounge. Pleasant light jazz was playing gently over the sound system, the staff were happy and friendly and, amazingly, two beautiful cakes and two coffees were ours for 3.50€. We continue to be surprised at the prices in the cafés and restaurants as food in the supermarket seems to be only a little cheaper than the UK and certainly more expensive than Spain. One of the reasons we are growing to love Portugal more and more is that they are not trying to provide food especially for the British tourist so you get to sample authentic local food in places that seem genuinely delighted to have foreign visitors and go out of their way to make us feel comfortable and welcome. That evening a truly ferocious storm hit the Iberian Peninsula. The rain pounded the roof of the van, there was thunder and lightning, howling winds and then … the electric went off. Nice Frenchman came to knock on the door to say that everyone in the parking had lost their electrics. It was only the next morning when I saw him outside talking to a council workman, that I found out that our splitter was the cause of the fuse. It wasn’t waterproof and, despite the fact that we had wrapped it in plastic, the ferocious storm had got in and caused it to fuse the entire system. Oh dear! I apologised to our French neighbour and the council workman but they reassured me it was fine “de rien”, then the Frenchman and his wife left and we got their powerpoint all to ourselves. That night the mysterious dose of collywobbles that had got Shirley decided to infiltrate my previously entirely healthy gut and rendered me incapable of moving more than three feet from the toilet. I sat all day wrapped in a blanket with a book moaning pitifully and being a wimp. Shirley was suitably sympathetic and we resumed our earlier position of staying put until it is safe to do otherwise. Our plan to visit the palace the next day was put on hold and we waited patiently until my own personal storm had also passed through. Travelling in November means that time limits on staying on free motorhome aires are not usually enforced as everywhere is relatively quiet. Towns are happy to have guests who will spend a little money and, in this case, we were very happy to have our safe place for another couple of nights. On the morning after the fourth member of the family was stricken by a tummy bug, Boo decided that he hadn’t had his fill of sympathy and woke us up at 5.30 a.m. moaning softly and standing by the door. I got out of bed, wrapped up in my usual selection of warm but weird emergency clothes and set off into the freezing morning, thinking that he had a recurrence of his earlier bug. A nightmare scenario of recurrent bouts of the runs passing around the four of us for weeks on end played in my head as I marched along behind a very determined poodle and a sleepy cockapoo. He passed several patches of grass and rough ground, refusing to do whatever it was he needed to do and tried to take me on a long walk to a big area of grass we had identified the day before. “Not a chance!”, I said to his haughty rear end as he tried to manoeuvre me in that direction, “Do it here, or I’m going home.” He gave me his best snooty look and then displayed the obvious signs that his bug was still in full flow. Back at the van, we decided that the only solution was to take him to the vet, which we did as soon as it was open. Here we were met by a very professional service, all delivered in English, a full health check for the two of them and some antibiotics, probiotics and soothing cream for Boo’s over active rear end. Comments were made about the chubbiness of Poppy who cast a doleful look in the vet’s direction and advice given as to what to do if things didn’t clear up. Finally a handshake, a very reasonable bill and a visit to the pharmacy later and we were ready to do what we had come here for three days previously. Before taking on the enormous delights of the palace we went to have lunch in the square, choosing a café at random and wandering in looking hopeful. This was November 30th, payday and the eve of a public holiday, so the place was busy. We were squeezed into the last remaining table for two and given the menu of the day. Soup followed by fish dishes we could neither pronounce nor understand. Fortunately, the waitress could help us and brought a dish of one of the offerings to show us. We said “that’s great” and ordered soup, the mystery fish dish and a half bottle of wine. The waitress was a mature lady who turned out to have a wonderful sense of humour. A short time later she came over to our table, wobbling slightly, placed bowls carefully on the table and said distinctly, “Two soups.” We burst out laughing when we realised she had obviously seen the Julie Walters sketch and was sharing the joke with us. Mafra Palace is huge. The holiday home of a series of Portuguese royal families and a hospital and monastery, it also has a number of exhibits of religious artwork and the chance to walk through the royal residences and see how the enormously rich royalty lived before they were overthrown in the early 20th Century when Portugal became a republic. It would take too long to describe the whole experience but here are a few highlights. The monks’ quarters and the infirmary are set up so that you can see the monk’s cells, the ward and the kitchens of the infirmary. Not being a big fan of museums, unless they tell me something about the real life of people in the past, I was particularly taken by the monks’ living quarters, including a special bed that was probably used for a mad monk. Really – that’s what the explanation on the wall outside said. The infirmary, like the one in Beaune in France, had an altar at the end of the huge room where patients could take part in mass, including of course funerals for the patients who didn’t make it. A bed for a mad monk. Upstairs in the Royal quarters, we were intrigued to discover that the King’s bedroom and living quarters were 220 metres along a long corridor from the Queen’s bedroom and living area. We wanted to know whether he sent a runner in advance to tell her he was on his way to take advantage of his conjugal rights or whether he would just turn up unexpectedly. We didn’t like to ask the staff, although I’m betting that most people wonder about it. We decided that by the time the King made it along the huge corridor, past all the servants who would be aware of his intention, the urge would probably have left him. … all the way along here to visit his wife. The staff on duty in the palace spoke good English and answered our occasional questions readily. It was one of these pleasant young women who told us the length of the corridor between the living quarters, adding with a grin and a fist pump that it is 1 metre longer than the Spanish one. It seems that the friendly rivalry between adjoining nations is alive and well here in Portugal. It’s time for us to head south, once we’ve had the dogs bathed and trimmed at the friendly vets tomorrow. We’re all in fine fettle and ready to find a little more warmth on the south coast. We’re feeling the cold and it’s about 13c. Sorry if you’re freezing in the UK. So pleased you enjoyed Buddha Eden. I was quite blown away by the vision of the millionaire owner. Love the pix. Do get to the winery and Palace run by the same family, just south of Lisbon near Setubal. I would rate this even higher than Buddha Eden. And the staff pointed us to a restaurant a few kilometres up the road. We liked the food so much we went back a second time. As always an enjoyable read Margaret! Pleased to hear the collywobbles settled down! In my opinion, nothing worse than that feeling that you’ve got to go and its 3 am and you’re about 100 metres away from the site sanitaires! Look after yourselves and enjoy the warmth! Enjoyed reading your latest news, almost made me want to turn around and visit those places we missed. Will add to the wish list for another time. Forgot to say the approach road is a once in a lifetime experience … Wi-fi is good too. It is a place for a safe and peaceful day or two as out in the countryside. Worth an email or phone call in advance to check and they will reserve a place. Do not think length would be a problem. Had an 8m Hymer next to us. Speaking French helps as owner Antonio used to work on French campsites. He has French lady called Isabelle living there too in her massive Concorde, been there four years and does the bread run etc. She answers the emails. Antonio can seem grumpy but loves a joke and dogs! Wild camp on parking at Boca do Rio is fabulous for birding and you turn off N125 at a handy Intermarche and fuel stop in Budens…we had a night there, dogs would love it! Love the two soups!. We have a proper three way socket!! Hi Margaret and Shirley, Grant and I are thinking of traveling to Portugal in February next year, I’d like to ask please, where here in west Lothian can you get fitted for refillable gas, also which is easier crossing to France and travelling to Portuguese or crossing to Spain then across, also price wise. Hope you don’t mind. Sandy ( Gorman ) McUlloch. Bangour Belle. I’m assuming you’re in a motorhome rather than a caravan and if so, I would have a look at https://www.campercontact.com/en/ where you can find loads of places to stop over en route. Many thanks Margaret, I’ll contact Knowpark, we’ve dealt with them ourselves before. Yes it’s a Motorhome we have a Malin Elnagh on a fiat Dicato. Our second van first was a wee Talbot express. This one is better though fixed bed. We’re getting too decrepit to make beds up then make the bed. ??. I read your blog a ll the time and I’m enjoying it. Worked with Shirley years ago, I was a pupil and she was a student nurse. Now we’re both retired. Grant worked in Bangour too he was in AnE plaster tech. Small worl. Anyway enjoy yourselves and the pups, will be reading on. Have a good time. Thank you so much Jane. That is such a lovely thing to do. I’m delighted you’ve found the blog and enjoy it. I love writing it and Shirley loves supplying the pictures. Thanks for the encouragement!